By this point, trying to come up with new nice things to say about Coen brothers movies is a little like trying to come up with new euphemisms when discussing Sarah Palin: Fun, but not really productive. So what I can tell you about their new adaptation of the seminal 1968 novel by Charles Portis is that it’s great. Really, really great. 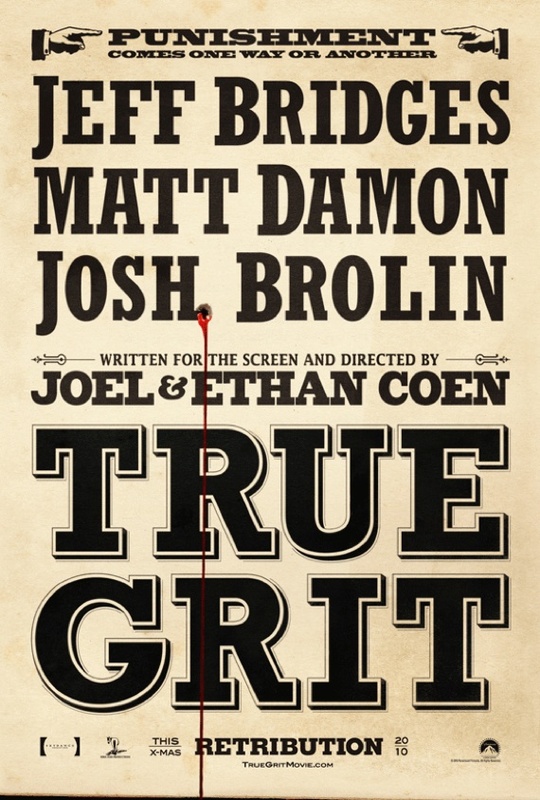 True Grit is set in the Old West, and is the story of Mattie Ross. She’s 14, her father’s dead, and she wants revenge. She hires Rooster Cogburn, a U.S. Marshall so unpleasant and cantankerous he could put a ‘Republicans For Voldemort” bumper sticker on the back of his horse. They eventually team up with La Boef, a Texas Ranger who’s most proud of the fact that he’s a Texas Ranger, and the three of them saddle up and go out to hunt the bad guy. This is a labour of love. It’s not only a great tribute and extremely faithful recreation of a classic story, it’s a tribute to an almost-lost genre. The Coens skirt genre so well and so nimbly that it’s a little jarring to realize that they have made a pure genre film here. This is an old-school western movie, in every sense of the word. When westerns are made nowadays, the Sergio Leone influence inevitably seeps in. And so to see a movie so humbly influenced by the films of John Ford and Henry Hathaway is suprising, although I shouldn’t be surprised by anything the Coens do any more. Although the temptation to label any new Coen Brothers movie as “Their best ever!” is strong, I’m going to resist it. I will say that this is quite possibly their most accessible movie ever. This is a straight-up western adventure tale, one that showcases their strengths as storytellers more than it does their reputation as quirky outsiders. The quick and funny script, which does a wonderful job of setting out each character’s motivations and backstory in a clear, concise, and contraction-free manner. The score. I’m used to Carter Burwell’s subtle and beautiful scores, but he’s really outdone himself here. The acting. Beyond a shadow of a doubt, the acting. First of all, if there is ANY justice in the world, Jeff Bridges (doing his best to apologize for phoning it in in Tron: Legacy) will win an Academy Award for his portrayal of Rooster Cogburn, so that he can say he’s won one for a movie that was actually good. Matt Damon does a solid job as La Boeuf, and I could honestly see best supporting nominations him, and also for Josh Brolin and Barry Pepper. But it’s Hailee Steinfeld’s debut film performance as Mattie Ross that is the true star turn here. Although she’s going to have some stiff competition by the likes of Natalie Portman, Annette Benning, and Jennifer Lawrence, I could see Steinfeld getting an Oscar nomination for sure. To sum up, this is a masterful work, and one that you should run to see. The stigma around dramas released at this time of year is that they are “Oscar Bait”: Stodgy, grim, and depressing. This film is pure joy. It’s a fun, action-filled adventure movie told by two storytellers at the top of their game. This entry was posted in Movies and tagged Cohen Brothers, Jeff Bridges, Movies, True Grit. Bookmark the permalink. What a surprise, the Coen brothers made yet another amazing movie…yaya ya. That’s sarcasm there. How these keep doin’ in I’ll never know, I’m just glad they do!